In relation to the amendment of art. 68 of Regulation (EU) No 1303/2013 of the European Parliament and of the Council and the amendment of Commission Delegated Regulation (EU) No 481/2014, on the treatment of expenditures for project staff, a change was made in the relevant texts of the Guidelines for applicants under the Second Call for proposals. Changes to the applicable requirements apply when the project staff will be employed on a part-time basis. On 17 January 2019, the Sixth Joint Monitoring Committee meeting under Interreg-IPA Cross-border Cooperation Programme Bulgaria-the former Yugoslav Republic of Macedonia was held in Berovo. The meeting was chaired by Mjellma Mehmeti - Petersen, Ministry of Local Self-Government and co-chaired by Denitsa Nikolova, Deputy Minister of the Regional Development and Public Works of the Republic of Bulgaria. Тhe Joint Monitoring Committee meeting of the Interreg - IPA CBC Programme Bulgaria – the former Yugoslav Republic of Macedonia 2014 - 2020 will be held on 17th January 2019 in Berovo. During the meeting the progress in the implementation of Programme will be presented, as well the results of the technical evaluation and the quality assessment of the projects under the Second Call for Proposals will be reviewed. Тhe results from the first two evaluation phases of the applications, received in the framework of the Second call for project proposals under the Interreg-IPA CBC Programme Bulgaria – the former Yugoslav Republic of Macedonia (1. 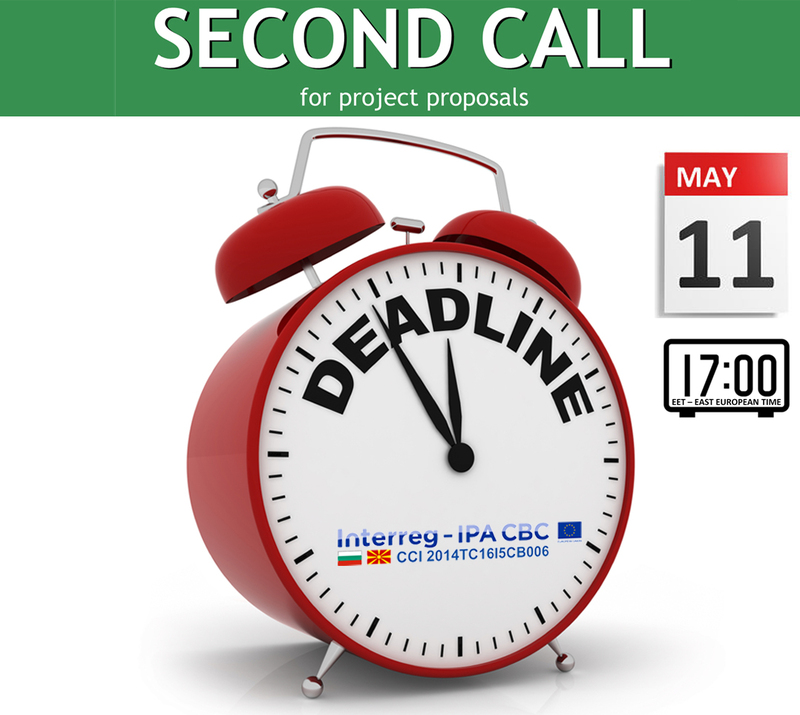 The submission of project proposals for the Second Call for project proposals under our Interreg-IPA Cross-border Cooperation Programme ended today, 11 May 2018 at 17:00 Bulgarian time (EET - East Eurepean Time). The deadline for submission of project proposals is 11 May 2018, 17:00 h. local time in Bulgaria (EET). Read more about IMPORTANT! DEADLINES!